That’s a loooong title, I admit. 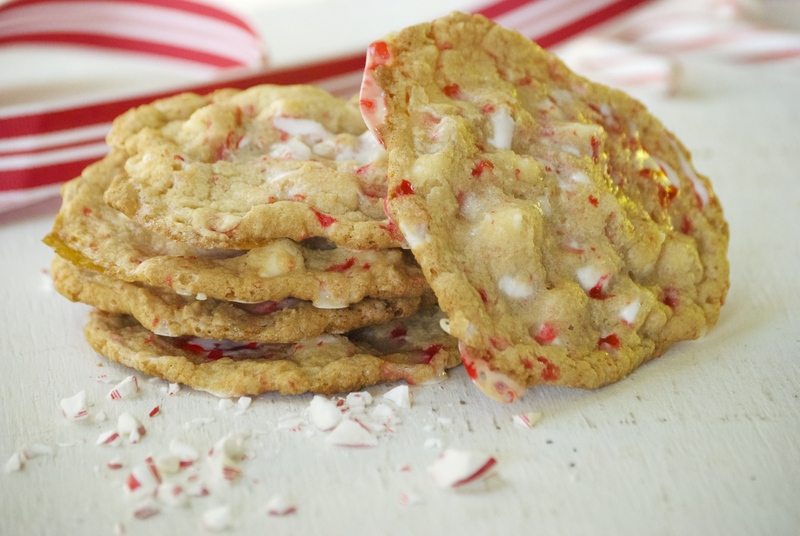 But it’s the only way to capture the glory that are these amazing holiday cookies. I came up with this recipe last year around the holidays and have played around with the recipe since. I think I’ve nailed it here, folks. 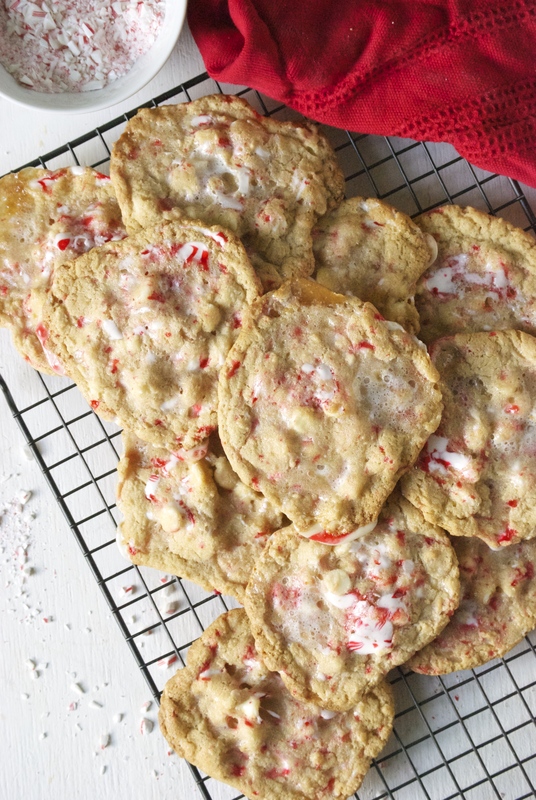 These cookies have everything– crispy, chewy, a holiday twist. There’s a fair chance that when you make them, you’ll eat them all in a day. They won’t make it to the holiday party. They’re that good. 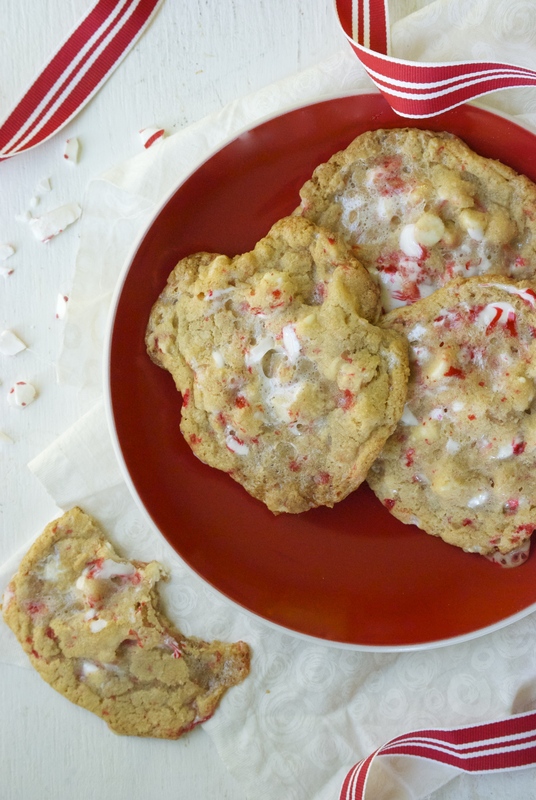 The flavors in this recipe remind me of one of my favorite holiday desserts that my mom would make. The dessert was one of those refrigerator pan desserts that gets better the longer it sits. She would buy that huge candy cane for this one and crush it up. It was folded into a custard of some sort along with some marshmallows. Then it was poured onto a graham cracker crust and put in the refrigerator. As a kid, I thought this dessert was just about the best thing about the holidays, aside from the presents. I haven’t had it in years, so I’m not so sure that my adult self would enjoy it quite so much. Spoonfuls of marshmallows don’t really do it for me anymore. Even so, I decided to try my hand at a cookie version of that nostalgic dessert. I love the flavors, but just wanted a better way to get them together. And I love what happens to marshmallows when you bake them into a cookie. They add a chewiness that is fantastic, but the ones on the outer-edges practically turn into a crisp toffee. 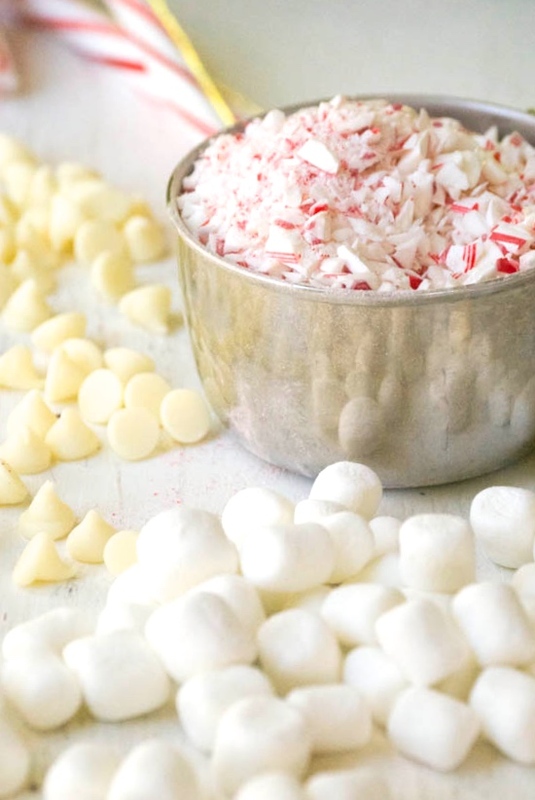 The peppermint candy makes the whole thing taste like the holidays. And the white chocolate, well, that’s a no-brainer. All good stuff. I know you’re going to love these– enjoy! 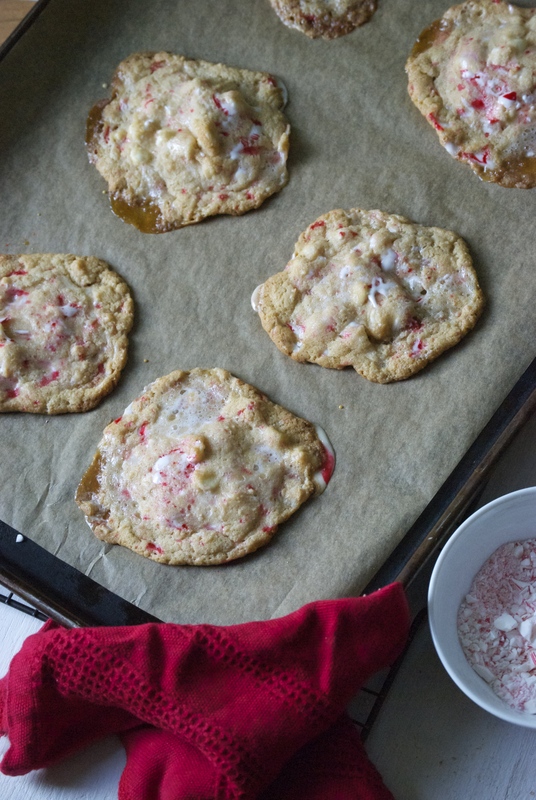 Note: Place the candy canes in a large resealable plastic bag and use a rolling pin to crush them. It works best to gently pound rather than roll over them. Preheat oven to 350°F. Line a large rimmed baking sheet with parchment paper. In a small bowl, whisk together the flour, salt, baking soda, and baking powder. Set aside. In a bowl of a stand mixer fitter with a paddle attachment (or use a regular bowl and wooden spoon), beat the butter and sugars together until nice and creamy, about 2 minutes. Then add the egg and vanilla and beat on medium for about 3-4 minutes, or until the mixture is light and fluffy and has incorporated enough air into it. Remember to scrape down the sides with a rubber spatula along the way. Then add the flour mixture to the butter and mix just until everything is incorporated. Do not over-mix. 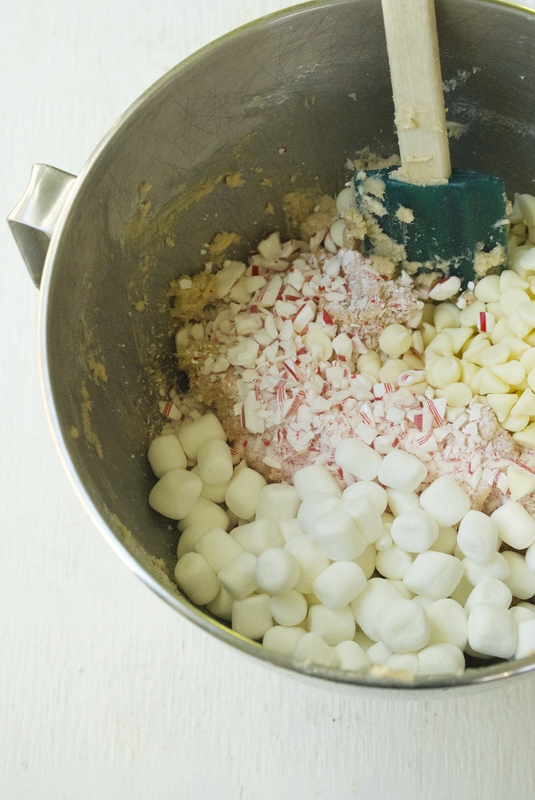 Remove bowl from the stand mixer and using a rubber spatula, fold in the white chocolate chips, 1/2 cup crushed peppermint candy, and marshmallows until everything is evenly distributed. Line a cutting board or another sheet pan with parchment paper. Using a small scoop form the dough into balls. You should end up with about 24 cookies. 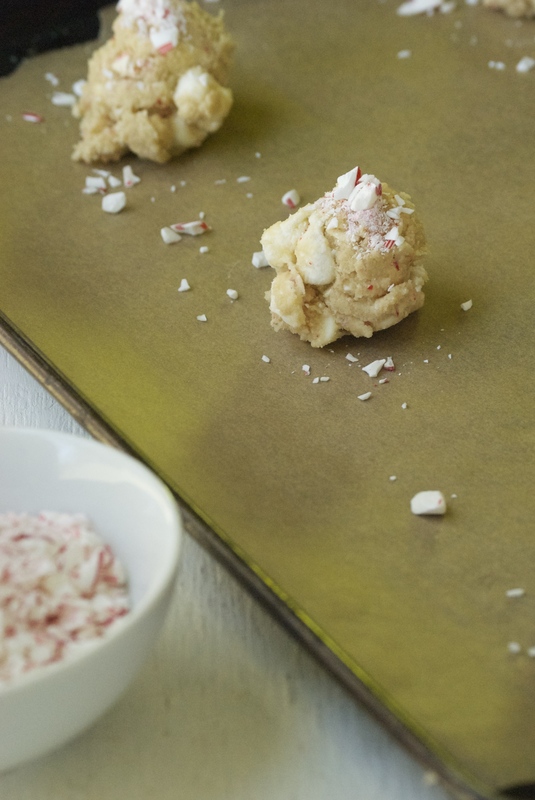 Sprinkle them with the remaining crushed peppermint candy and a bit of sea salt. Place them in the freezer for about 15 minutes. Then take six out (leave the rest remaining) and place on the lined cookie sheet. This particular cookie spreads out a bit, so six on a cookie sheet works well. Bake for about 11 minutes, or until the edges become golden-brown. Remove from oven and let rest on the pan for about two minutes (a bit longer than the average cookie because the marshmallow needs to set). 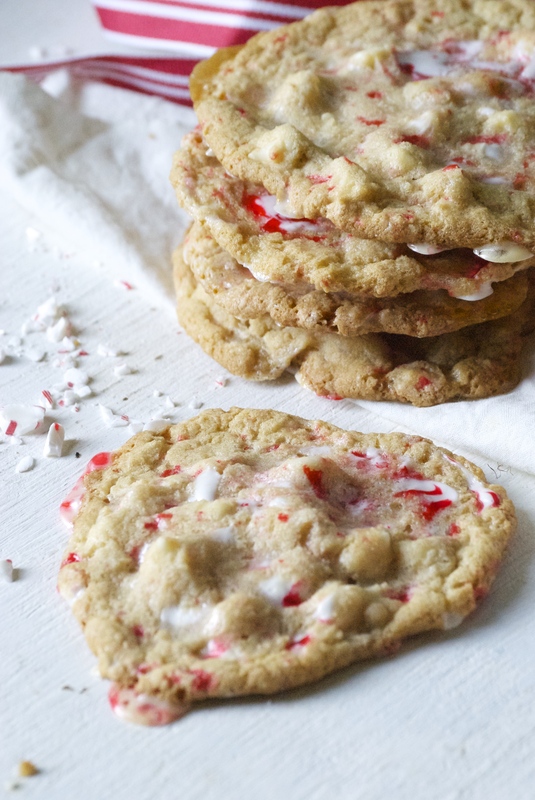 Once the cookie feels sturdy enough to move, place it on a cooling rack and repeat with the rest of the cookies– taking them out of the freezer as you need them. They are magnificent the first and second day if left out uncovered. They tend to lose their crispiness in an airtight container, but are still quite delicious. Hope you enjoy them!